The Town Council purchased an overgrown area of land off Blundell Road in 2011. Please visit the photo gallery to see the evolution of this community area! Due to the small size of the site, it was considered less suitable for individual allotments plots so it is currently being developed for use by community groups and organizations. A tarmac path replaces a muddy, overgrown approach, a small car park has been created and work is moving on at quite a pace. Raised beds and others at ground level have been created and prepared and more than half are already under cultivation. 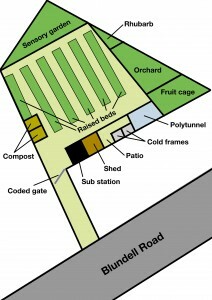 The site now boasts two sheds for tools and equipment, a fruit cage and a green house. The greenhouse, minus its glass was moved in one piece, much to the amusement of local residents as it was carried the quarter of a mile to its new location. Thanks to donations of surplus paving slabs by local people, almost all the paths have a paved surface. Hanging baskets adorn part of the site and several beds have been marked out and planted for shared crops such as herbs, strawberries and rhubarb. Six skips full of debris and rubbish have been removed and 16 tonnes of soil have been brought in to fill the beds. More than 700 paving slabs make up the paths – all have been donated and brought to the site. 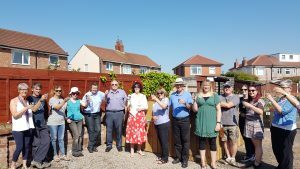 The Ormerod Trust, The Baptist Church, Holly Lodge and the town’s Youth Council have started work on their plots and a wide range of vegetables are growing well. The site is an excellent example of community involvement and activity as groups and local residents have all become involved. Blundell Road Community Allotments have been nominated for a Neighbourhood Award arising from this year’s St. Anne’s in Bloom competition. 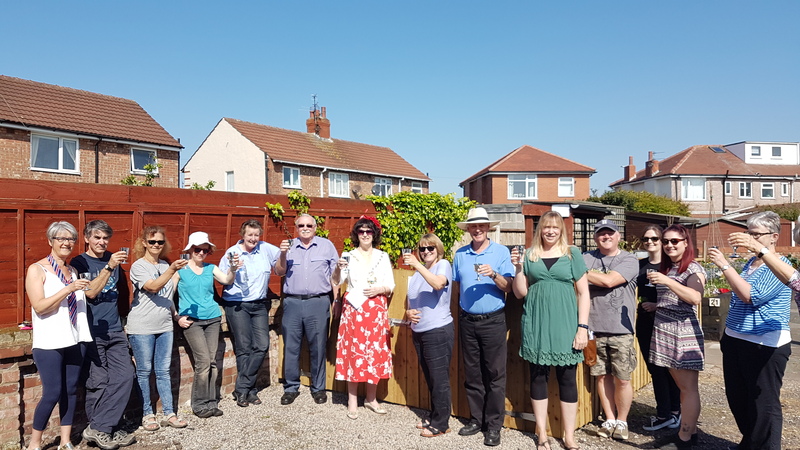 The new allotments provide ‘taster’ plots for people on the Allotment waiting list and areas where community groups can grow fruit, vegetables and flowers. The site boasts a greenhouse, a poly tunnel and space for social interaction. A composting toilet was installed recently which greatly improves the site user accessibility. The judges said how impressed they were with what has been achieved on what was a disused piece of land and this has formed the basis of the nomination.